These little bites are delicious, full of energy, and take virtually no time to make. I made a few batches of these over the weekend and both my husband and I love having them in the fridge to snack on. While the recipe below calls for a few different types of nuts, it could certainly be made with whatever you have on hand. I decided to use cashews for their creaminess, pecans for their buttery taste, and walnuts for their high healthy omega-3 fat content (plus I had them all in my kitchen already!). However, feel free to use what you have or like, and see what works best for you. Also, plain cocoa powder works just as well as raw cacao powder. The dates add some natural sweetness and act as a great binder, and I threw in some hemp seeds for an extra protein boost. These bites have no added sugar and are a great source of protein, healthy fats and fiber. Win-win! *Also, just a note about nuts: I LOVE nuts of all kinds and keep a wide variety on hand always. I usually buy my nuts at Costco, and keep them in the fridge or freezer which can help preserve their healthy fats from going rancid once exposed to oxygen. There is so much research on how beneficial nuts are for overall health, so I try to incorporate small amounts throughout my diet regularly and each day. I’m definitely thankful for no nut allergies in our house! Put all ingredients into a food processor and pulse until everything is very well-blended and the mixture starts to form clumps. Roll in between your hands into small balls, about 1-inch diameter (consider placing a nut in the center for a crunchy surprise!). 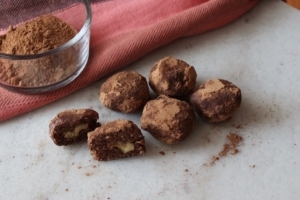 Consider rolling in extra cacao powder for a very chocolatey taste. Chill in refrigerator for at least 30 minutes before eating.